Late Renaissance and early Baroque music from Austria and Italy in these Dutch/German collaboration. I. 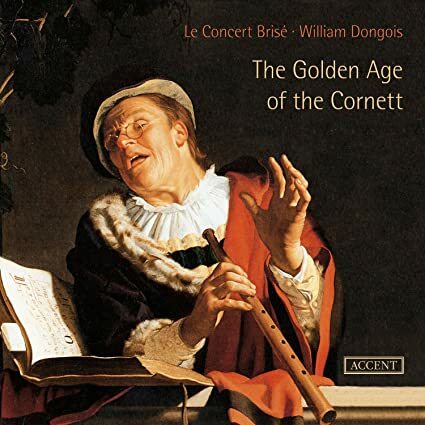 The Golden Age of the Cornett (Le Concert Brisé/William Dongois). Accent CD ACC 24261. On this double CD, together with the ensemble Le Concert Brisé, he dedicates himself to the Golden Age of the cornett: between 1580 and 1630 in Northern Italy when the instrument enjoyed its greatest popularity amongst composers and listeners. Secular dance movements and songs of the Seicento, the Italy of the 17th century, can be heard on the first CD. William Dongois pays special attention here to the art of diminution, ie ornamentation and figuration. In the music of this period, the score served only to provide a basic framework for the improvised embellishments of the musicians. The second CD features sacred instrumental and vocal music at St. Mark's Cathedral in Venice during the time of Monteverdi, with soprano Julie Hassler and violinist Christine Moran joining William Dongois as soloists. Vocal and instrumental works alternate with each other, clearly showing that Venice stood at the centre of the development of a new style and occupied a pioneering role in all of Europe. II. 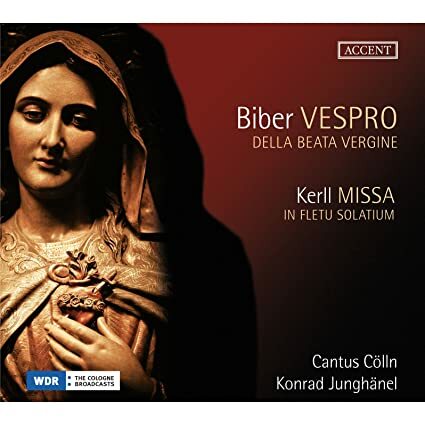 Biber: Vespro della Beata Vergine (Cantus Cölln/Konrad Junghänel). Accent CD ACC24286. Johann Caspar Kerll’s 'Missa in fletu solatium' must have been composed in connection with the festivities following victory at the great Battle at Kahlenberg, from which the imperial army emerged victorious over the Ottoman army under the leadership of Grand Vezier Kara Mustafa Pasha. Kerll lost his first wife during the plague epidemic and had to witness the dwindling numbers of his colleagues in the court orchestra. Immediately after this, he witnessed the horrific Turkish siege. Both events must have shaken him to his very foundations. This is, in any case, conveyed by the sounds of his Mass, which reveals astonishing compositional artistry; its gloomily imploring tone allows us to sense but little of the relief over the happy outcome of the siege. Instead of exuberant, unrestrained jubilation, we experience in this music, once more, the tortures and fears of the maltreated Viennese population. In 1693, the year of the death of Johann Caspar Kerll, Biber published an extensive collection of psalm settings entitled 'Vesperae Longiores ac Breviores', intended to provide music for Vesper services. In the present recording, the six-part cycle of 'Psalmi de B. M. Virgine' has been expanded into a small Vesper of St. Mary. In accordance with the liturgical customs of the time, brief sonatas and solo motets are performed in place of the introductory antiphons. The sonata introducing the Magnificat is from Biber’s 1683 collection 'Fidicinium sacro-profanum' printed in 1683, whereas the motets assigned to the remaining psalms are taken from Kerll’s first opus, the 'Delectus sacrarum cantionum' published in Munich in 1669. Founded by Konrad Junghänel in 1987, Cantus Cölln swiftly became established in the international musical scene. During the 25 years since its formation, the ensemble has received great acclaim for its revitalisation of long-neglected works in the repertoire alongside its groundbreaking interpretations of a number of standard works of the Baroque repertoire, many for harmonia mundi. III. 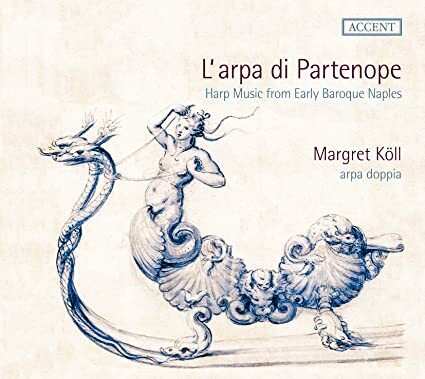 L’arpa di Partenope: Harp Music from Early Baroque Naples (Margret Köll, arpa doppia). Accent CD ACC24192. Recorded in the Evangelische Brüdergemeinde, Neukölln, Berlin, July 2012. During the Spanish foreign dominance over the kingdom of Naples in the 16th and 17th centuries, lively musical and cultural relationships were forged between Naples and Spain and the city at the foot of Vesuvius could count itself as a European cultural centre on an equal footing to London and Paris. A Neapolitan delegation of virtuoso musicians and singers was invited to participate in the marriage celebrations of Philip II in Madrid (1543), among them the harpist Gian Leonardo, the 'new Orpheus' of this era. These musicians were members of the capella reale, the orchestra of the royal court of Naples. The first maestri di capella were Spaniards followed by Jean de Macque who was later joined by his pupils Giovanni Maria Trabaci und Ascanio Mayone. In the capella reale, harpists also found regular employment. The musicians performed at the major musical focal points in Naples, primarily in the following locations: Palazzo Reale, the Gesualdo family home, Chiesa S. Annunziata, Oratorio di S. Filippo Neri and Tesoro di San Gennaro. The photographer and filmmaker Armin Linke documented these locations in beautiful photographs which appear in the cd booklet], during a trip to Naples in December 2012. As a specialist in historical harp Margret Köll plays as soloist and as a continuo player in various ensembles: Il Giardino Armonico, Accademia Bizantina (Ottavio Dantone), Europa Galante (Fabio Biondi). She has performed chamber music with Luca Pianca, Enrico Onofri, Dimitri Sinkovsky, Riccardo Minasi and Vittorio Ghielmi including on the promotional tour for the CD 'Maria Malibran' with Cecilia Bartoli, and the CD and promotional tour of 'Lettere Amorose' with Magdalena Kozena.